Add Agent Venom to your Marvel Universe Pin Mates™ collection! Retro-styled, 2-inch scale wooden collectible with 360-degree artwork. Individually numbered within the Pin Mates™ Silver Series! It's here: The Agent Venom Pin Mates™ Wooden Collectible from Entertainment Earth is ready for your collection! 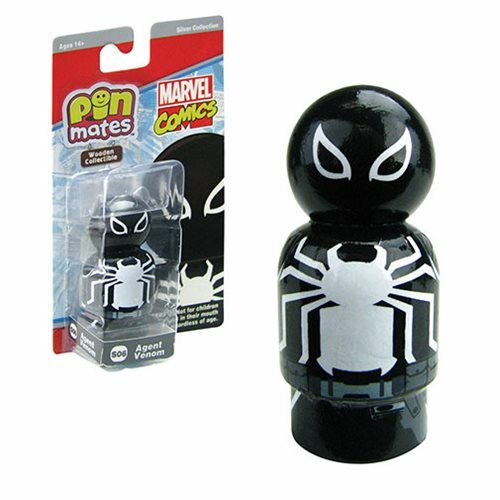 The adorable 2-inch scale wooden figure featuring Agent Venom from the classic Marvel comics joins the growing line as number S06 in the Pin Mates™ Silver Series. Designed in a retro style, this miniature wooden figure showcases Eugene Thompson as Agent Venom with detailed 360-degree artwork that includes hand-painted details alongside limited decal graphics. Uniquely numbered on the bottom of the figure and on the packaging, the Agent Venom Pin Mates™ secures its place as number S06 in the Silver Series for eternity. Ages 14 and up.